Jordan Lukaku is close to becoming Newcastle United's first January signing - but when could he make his debut? The 24-year-old, younger brother of Manchester United's Romelu, is set to undergo a medical ahead of a six-month loan move from Lazio. Lukaku, who can operate anywhere on the left side, has been been drafted in to challenge Paul Dummett for a first-team spot due to his ongoing injury problems. And the Belgium international's bid to stake an immediate first-team claim could begin tomorrow when the Magpies host Watford in the fourth round of the FA Cup. However, United are working against the clock as they put the finishing touches to confirm Lukaku's arrival. Premier League rules states a new signings will only be eligible to play in the club's next fixture - IF they are signed by noon on the day prior to the date of such match. This means Newcastle have just a few hours to register Lukaku in order for Rafa Benitez to have him at his disposal against the Hornets. Of course, Benitez could take the decision not to field Lukaku, regardless of whether he is available or not. 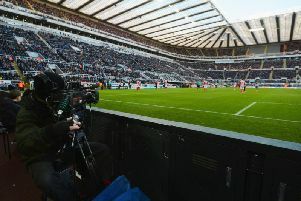 The 58-year-old chose to field a weakened side in the previous round against Blackburn Rovers - where Newcastle won in extra-time of the replay. Javier Manquillo started both games at left-back before Matt Ritchie dropped into a wing-back role for the vital 3-0 win over Cardiff City in the Premier League. If Benitez decided to field a similar starting 11 to that in the previous round, the visit of English champions Manchester City on Tuesday is likely to see Lukaku brought into contention.